While we were working on our floors downstairs, we realized that we would need to take the toilet in our downstairs bathroom out to lay the floors underneath it. While the toilet was out, we decided that we would just replace it, because it's been in bad shape since we moved. We had a plumber look at it but it still never really flushed properly. So, while the toilet was out, I decided it would be the perfect time to paint in that cramped area behind it. (Side note: I'd been planning on painting the bathroom at some point in the future.) I knew the color paint I wanted to use (Sherwin Williams Urban Bronze) and since it was a small room, it was a quick job. With the new paint, I hung new art, hardware, and got a couple of new towels and accessories. We finished up this mini makeover in a hurry, since it was just a couple of days before Hayden's birthday party. I'm a little late to get on the washi tape train, but can I just tell you how much I love it?! I picked some up for a craft for Hayden's birthday party (one you never saw- darn camera) and I had some left over so I decided to washi tape a few household items. I love that washi tape is a. easy to apply and b. easy to take off (if I ever get tired of it). Anyway, my tape of choice was this gold washi tape from Paper Source. I love the gold-accent trend right now, so this was an easy choice. The first item to be washi-ed: this cute little lamp from good old Target. I love the pink and white combo but when you add gold? Perfection. Numero dos: This heavy wooden tray on our coffee table. I love the size but the wood-on-wood look is a little boring. So I added a gold washi border to the top of the tray and now it stands out nicely. If this blog post doesn't convince you that you need some gold washi tape in your life... I'm not really sure what will. Actually, they have been for about 3 weeks now (nothing like a first birthday party to kick your DIY projects into high gear. We are so happy with the way the floors turned out. With just one type of flooring throughout the entire downstairs, the whole space feels much bigger. The floors are a nice rich brown give the whole space an updated feel. Though cork is definitely a unique choice, we are happy we went that route. It doesn't feel hard when you're on your feet all day chasing a baby and it always maintains a moderate temperature. We decided to go the non-DIY route when it came to baseboards and we couldn't be happier with that choice. 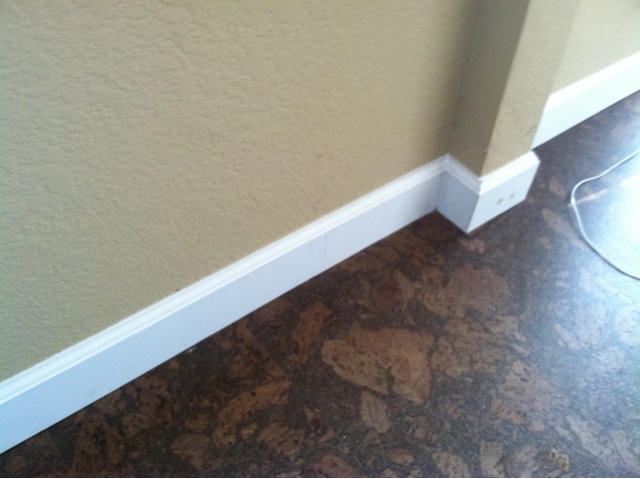 We selected 4 inch baseboards with quarter-round. The baseboards really finish off the floors and I love the juxtaposition of light and dark right next to each other. As of Saturday August 3rd, our baby is officially a 1 year old- oh my! I can't believe how fast this year has gone and how much our little guy has grown and changed. He is such a sweet, lovable, independent, curious, silly little boy! Some highlights from the last month: Though he's not quite walking independently, Hayden loves pushing around his cart, and cruising around furniture. He is such a quick crawler and can make it across the house in about 15 seconds. Thus, dog food and anything else at his level has been put up high. Hayden officially weaned himself from breastfeeding. He decreased his feedings a lot in the last month and since we are doing the Baby Led Weaning Approach, we let him dictate when he was ready to stop. I was a little worried that this transition would mean the end of that special bond, but am so happy to report that this guy has gotten even cuddlier in the last month. He will often take a quick break from playing to crawl into my lap and snuggle with his head on my shoulder. Also, he's occasionally waking up a night for a hug and kiss and then he's straight back to bed. I love, love, love these moments, even when they happen at 2:30 am! For Hayden's birthday, we had a small pancake party in his honor. He loves pancakes and we thought this would be the perfect way to celebrate or little man. We served pancakes, bacon, mimosas, and coffee and had a great party with friends and family. The type-A pinterest--obsessed mama side of me might have gone a little overboard with decorations and presentation, but luckily I had my sister (thank you Emily!!) here to help out with everything! Sadly, our memory card wasn't in our camera as we took pictures :( so we don't have very many of the actual party or decor- only a few phone pictures that I took afterward and those e-mailed to us by friends. Even without the pictures, it was a perfect day! Hayden was so happy throughout the whole party and afterward as well. 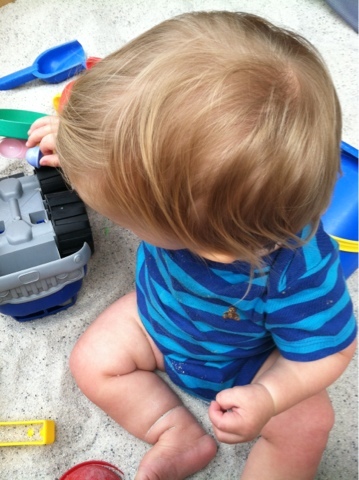 His big present from Mama and Dada was a sandbox- which he loved. We have already spent a fair amount of time in the sandbox driving his trucks around. We had a really wonderful day with our little man and we feel like the luckiest parents in the world! Two: Oh my gosh! We've been without a working washing machine for 3 weeks! 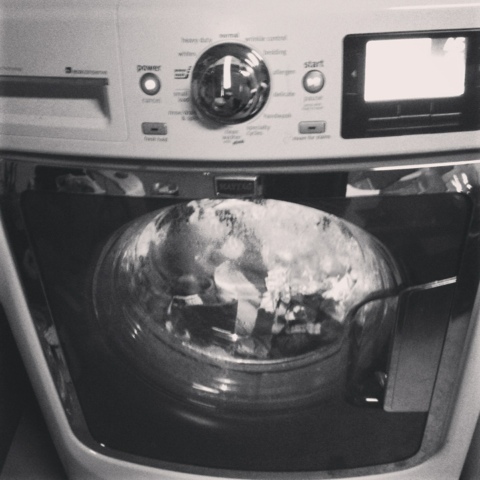 After 4 service appointments, we finally are back in business and I've never been so thrilled to do laundry. We are grateful to be able to use our cloth diapers again and not to have to spend $20 + each time we head to the laundromat! Three: Yesterday Hayden and I were playing in his sandbox (a birthday gift from his Daddy and me) and we were filling up his dump truck with sand and then dumping it out and I said, "Say bye bye sand!" And he did! He says some words but this is the first time he repeated a word right after I said it. So we did this about 10 more times and every time he told the sand "bye bye." Oh, my heart! Four: Now that we have new flooring, we need a couple of area rugs to warm up the space. I've purchased most of the rugs already but I can't quite decide on one for our entryway. I think that I'll probably wait until we paint and finish some other projects so that I can better decide the color . Anyway, I LOVE this site and have found about 50 rugs that I would be happy to have in my home. Decisions, decisions. Anyway, we spent the first Friday night pulling up old carpet, carpet tack, and parquet tiles. The parquet came up like no big thing (as in no need for a hammer or chisel, just use your fingers to pull them up). The carpet + tack took a lot more work. So, the "demo-ing" portion of this project took about 5 hours. The next morning, after some excessive vacuuming, we laid the underlayment (an eco friendly recycled rubber material) to even out the floors and absorb some of the sound. My dad came over for the morning hours to give us a jump start and coach us through the floor laying process. The cork was relatively easy to install- no glues or nails since it's a floating floor that locks into place. When there weren't any cuts or angles in the room, we could get it down pretty quickly. Nick did the lion's share of the work on this floor. I helped as much as I could, but even with my mom babysitting several days, I still had to juggle taking care of Hayden and multiple trips to the hardware store for this or that. Besides, Nick tends to be a one-man show when it comes to projects. The first weekend, we got through the dining room, living room and entryway. By Sunday night, the only part we had left was the bathroom and the kitchen- very small by comparison ,but also very tricky for the amount of cuts + the appliances, etc. So, that's part one! 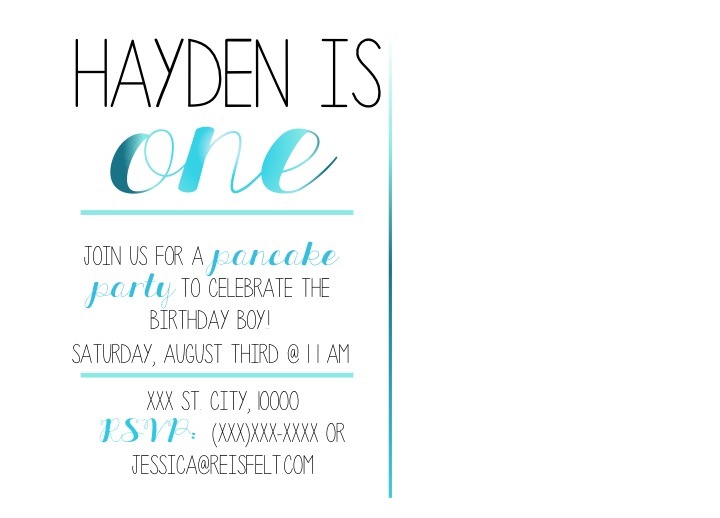 I'll be back soon to share the end result (hopefully- it's Hayden's birthday on Saturday so we are in the midst of some serious party preparations - hence the floors)!